I know the guys from Reverb Communications pretty well. After all, as the PR representatives for many games like Rock Band and Deadly Premonition, they act as the middle man between publishers and games journalists. A great group of people, they are very professional and get straight to business. It makes everyone's jobs a little easier, and while the consumers don't know about them very much, these PR houses are important. So here's a crazy thing: Reverb Communications is now publishing videogames. If you can't tell, this is all sorts of weird for someone in my position, but if the game itself is good, what does it matter who publishes? 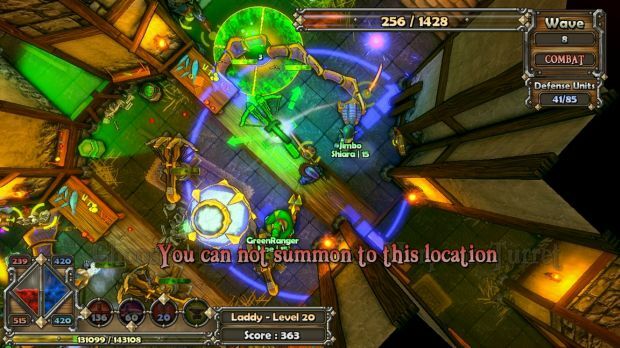 Thankfully, the so-named Reverb Publications seems to have made a smart decision with the first game they are bringing to XBLA and PSN: a rather ambitious tower defense game/action title called Dungeon Defenders. 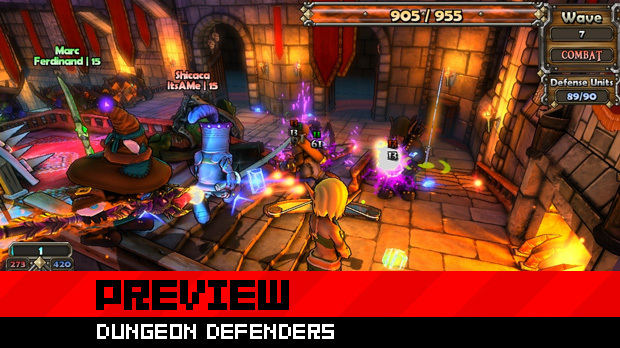 Co-published with developer Trendy Entertainment, Dungeon Defenders is actually incredibly dynamic, lots of fun, entirely unique, and certainly worthy of attention. Immediately, indications show that Dungeon Defenders has a cute little story. Four heroes have sealed away some major evil in a gigantic crystal. One day, they leave their castle to go address some problem, and they leave behind their kids. Of course, kids being kids, they screw around, break a chunk of the crystal, and unleash an evil hoard of orcs and trolls hell bent on breaking into their castle and unleashing the bigger baddie. Thankfully, the kids themselves are pretty capable, with each representing one of four classes. First we've got the Squire, a young knight whose actions are more hack 'n' slash, while his towers act more like spin blades and cannon balls. The Mage Apprentice is an elemental projectionist, who can perform actions like mana bombs and launch fire balls, while his towers launch massive blasts of energy. There's also the Monk character, who acts as a sort of middle ground between the Squire and the Mage Apprentice, and the final character, the Huntress, has skills based upon trapping. Unfortunately, I only had time with the Squire and the Mage Apprentice, but clearly each one is unique, with their towers ranging from turrets to barriers. Missions take place in a gigantic castle, from the lowest dungeons to the highest parapets of the the fort. 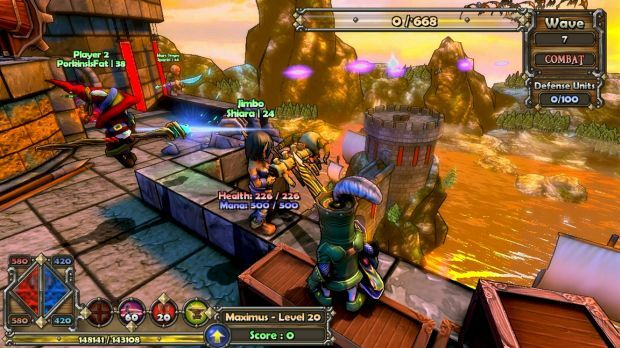 Each level has a series of difficulty options to choose from, with all the best loot and experience coming from the most-difficult missions, and players are encouraged to replay levels. The missions themselves play out in two phases. The first of which is the building phase. 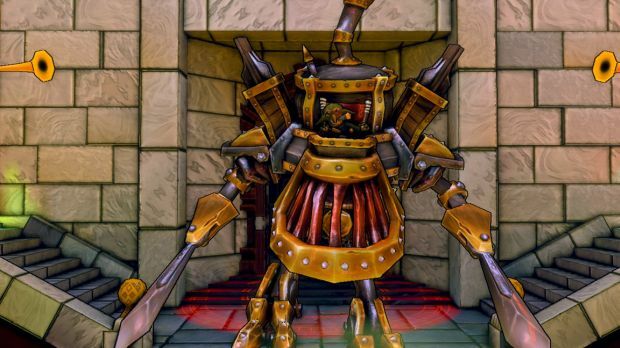 With only a limited amount of mana (which is used to build towers and do special attacks), and a limited amount of time, players have to be quick to place barricades on hallways and stairwells that monsters may wander through. Towers can basically be dropped anywhere, from directly on the ground to on the handrails of staircases. Single players will have more time and less enemies, but multiple players can delegate duties and areas of the map to drop towers and defend against foes. That's actually where the second part of the game opens up. Waves of enemies will come charging out of monster closets, and usually you can see the bottlenecks where they come rushing forward. Typically, the turrets and barriers will generally take care of themselves, leaving you free to dive into the action yourself. However, it's important to keep checking in and making sure those defenses have not been destroyed. Multiplayer really makes this easier, as each person can focus on a certain area of the map, or you can have someone act as a tank while other members makes sure the turrets and stuff are up to shape. It's the bosses, however, that will pose the biggest problem; I was shown a massive demon that causes some major issues in the center of one map. So while we have to deal with the regular bad guys charging toward the crystal, there is also a major boss with typical boss battle techniques -- in this case, hacking at some electric points to zap the demon -- so there can be a lot going on. It's an entirely enjoyable challenge, and it never feels unfair. Customization is out of control here. Everything from the color of your giant crystal you are protecting, to the stats of your equipment and weapons, to your skills (Wanna be a tank attacker? Or a super powerful tower master? ), your character stats, and more. Considering the developers at Trendy Entertainment are super huge fans of Diablo, equipable items will fall like crazy as players defeat enemies. There is always something to do to make your character super powerful. Items themselves can be upgraded as well, so good loot can become even better. Multiplayer is as easy as drop-in couch play, online multiplayer, and any combination of the two. Character stats are tied to your profile, so no matter what you do and what loot you get, it'll always stay with your character. Everything is very easy to deal with, and there are loads of flexibility to bring players in and out. With up to four players, there is some scaling to make sure there is still a challenge, and with all of the difficulty options, it looks like players will always have be able to take on a real challenge, whether it be one player or four. Dungeon Defenders is a true surprise. As a major fan of the tower defense genre, I found the game to be a fantastic twist on the genre. Who would have thought that the fusion between action-adventuring, multiplayer co-operative, and tower defense would work so well. It's an exciting new approach, and I'm ready to see what Trendy Entertainment and Reverb are going to launch with later this year.